How cool is this crazy stuff? 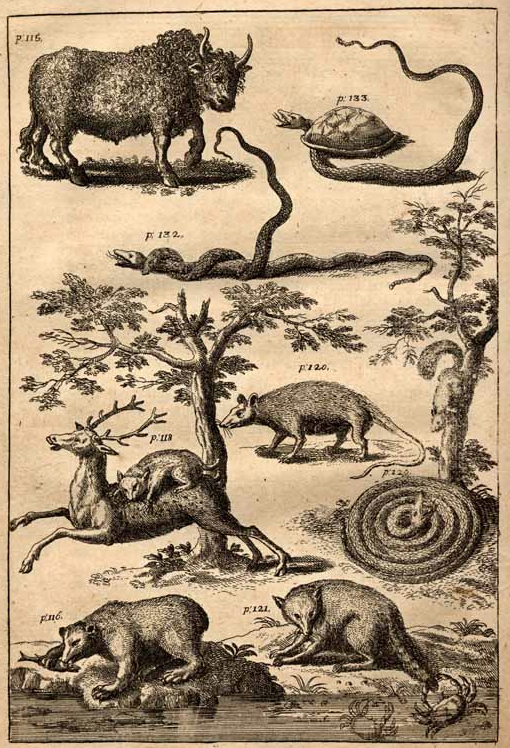 If you're wondering, left to right and down from top left: bison; snake and turtle cuddling; two snakes having at it; possum; a bobcat attacking what is probably an elk; a coiled snake below a squirrel; bear; raccoon; crabs. The story has been that Lawson, a young man anxious to make his mark on the world, was assigned by the eight Lords Proprietors who owned the Carolina colony to walk the territory and find out what they owned. Well-connected in England (his father was a physician, his great uncle was a vice-admiral, his mother was related to the Archbishop of Canterbury), Lawson might easily have known the descendants of the original lords and might have received a commission for his journey from them. He also knew James Moore, who gave him free passage to Carolina from England and then became governor. So there's any number of people who could have said, "Hey, John -- take a walk and tell us what you see." Moore himself had gone out to look around western Carolina. Though it's actually not certain that anybody told him to take his journey at all -- a young educated man with the goal of joining the Royal Society (based at Gresham College, which he attended), he may just have been looking for something to do to earn some attention. Anyhow, he made the trek. Then spent another several years living in Carolina -- founding the towns of Bath and New Bern, gathering specimens, getting to know the Indians who lived nearby, and acquiring land. He became surveyor general of the colony and was part of the crew sent to try to clarify the colony's border with Virginia. In 1709 he sailed back to England, to print his book and discuss plans for further settlement of the colony. The book was an enormous success, rushed into press by its publisher (one James Knapton, according to E. Thompson Shields (whose work constitutes the source for much of the following discussion) the head of a group of London booksellers creating a series called A New Collection of Voyages and Travels: With Historical Accounts of Discoveries and Conquests in All Parts of the World. Knapton liked Lawson's work so much he rushed it into print ahead of schedule. 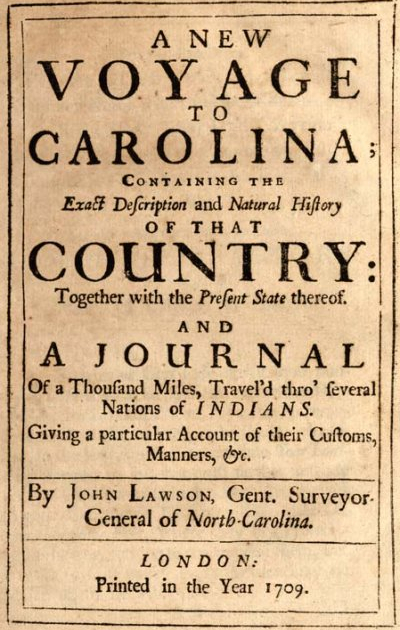 Different pieces of the book came out in the series at different times: first an introduction and Lawson's journal; subsequently his "Description of North-Carolina" in installments and his "Account of the Indians of North-Carolina" the same way. The installments were printed in volume but bound only as needed, so when all the pieces had been printed, they could be bound together and sold as a single volume, which they were by the end of the year, as the title page above shows. From the May 17, 1709 issue of the London Daily Courant. Lawson's book was widely copied -- several German editions came out, and the book's contents were used without attribution (common back in the day) in a 1737 book by John Brickell called The Natural History of North Carolina. Its description of Carolina as "a delicious Country" may have been the most important source helping spur settlement and further exploration of Carolina.